As Fraulein Kost in "Cabaret" at Theatre Under The Stars, Houston. A Seattle-based performer and member of Actors' Equity Association since 2000, Angie has performed principal roles with nationally prominent theatres including The 5th Avenue Theatre, Village Theatre, Seattle Children's Theatre, Ordway Center (St. Paul), Theatre Under The Stars (Houston), and American Musical Theatre of San Jose. Thanks to musical theatre, Angie's been cut in half by a magician's swords, dragged around in a cart by a pony who accidentally pooped during the opening number, shared scenes with rabbits and boa constrictors, roller-skated onstage, wrestled three hillbilly brothers, and been tossed in the air by a baseball team. As an indie film actress whose work includes award-winning feature films Gory Gory Hallelujah and Switchmas starring Elliott Gould, she's been burned at the stake, fought over by a clown and a mime, ridden a cannon, risen from the dead, and played Mrs. Claus in outer space. 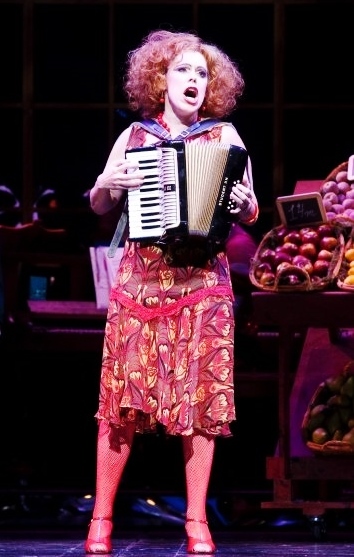 As an actor-musician, she's played instruments onstage in roles as diverse as a beehived housewife who plays a mean rock piano (Vi Petty in Buddy: The Buddy Holly Story at The 5th Avenue Theatre) and a Nazi prostitute who plays accordion (Fraulein Kost, 5th Avenue's Cabaret, regional tour). In 2017, Angie reprised her 2011 role of Hattie in Seattle Children's Theatre's new production of Go, Dog! Go! and appeared as Molly in Unsinkable Molly Brown for Showtunes Theatre Company at Benaroya Hall (a role she performed previously at Village Theatre). Other mainstage credits include Electra in Gypsy starring Judy Kaye, Billie in Babes In Arms, Sally in Cabaret, Gloria in Damn Yankees, Rosalie in Carnival (Backstage West Critic's Choice - Best Actress in a Musical), Sheila/Mildred in the pre-Broadway run of It Shoulda Been You, rock star Jesse Dove in the Balagan Theatre workshop of Citizen Ruth directed by Tony nominee Dan Knechtges, and real-life vaudeville queen Elsie Campbell in the world premiere production of Bootlegger. In 2018, Angie can be seen creating and performing a commissioned piece for Bell & Battery (Rendezvous) and workshopping new musical Anybody Can Do Anything for The 5th Avenue Theatre's NextFest.